The Breakfast Club is undoubtedly one of the most iconic and classic movies of the ‘80s. 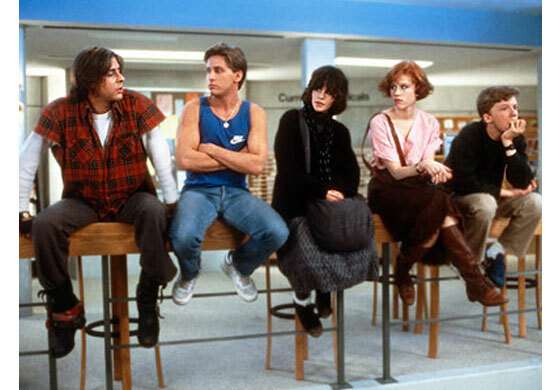 Five mismatched students, the athlete; the brain; the princess; the criminal; and the basket case are forced to spend the day together in Saturday detention. The Social Penetration Theory explains how individuals grow closer to one another in their relationships. There is a public layer of a person that everybody has access to. It is simple things that can be told in the early-stages of relationships, like favorite food or their college major. However, as the relationship begins to progress, the layers of an individual progressively get deeper. This is typically illustrated as peeling back the layers of an onion, each layer revealing more information. At the very core of an individual is their most deeply held beliefs and convictions. The theory states that in a normal process of building relationships, people begin at the top layer then slowly dig deeper and uncover more layers of an individual. The law of reciprocity creates equity in a developing relationship. One person is open which leads the other person to be open as well. Reciprocity is a give-and-take exchange which allows people to progress equally as they reveal more personal information. There is a famous scene in the Breakfast Club where this band of misfits use the Social Penetration theory to learn more about each other and build unlikely friendships. In this scene, all five students are sitting in the library talking to one another. They have learned a lot of peripheral facts about one another throughout the day and this scene really shows the wedge being driven into the onion. The students are having a light-hearted conversation when one of them asks Emilio “How are you bizarre?”. Emilio, who is a star athlete, begins to tell everybody why he was in detention that day. He begins with some basic facts about how he ended up in detention. However, as his story progresses, the topic quickly switches to a serious tone as he explains why he did what he did and it reveals personal information about his relationship with his father. As he is telling his story, he is slowly peeling away the layers of onion as he self-discloses more information. By the end of the story, he is almost in tears and the others are silenced by the depth of penetration that has been reached. Emilio’s story allows the other members to be open with him and also reveal personal information about family relations. When Emilio ends his story, Judd, the criminal kid with a bad background, comments that “I think that your old man and my old man should get together and go bowling”. This reciprocity opens the door for Judd to reveal personal information about his relationship with his father. The social penetration theory helps us to understand how the scenes in the Breakfast Club play out and how the relationships develop among the students. By using this theory to understand the behaviors of the students, we can better prepare to determine behaviors in our own relationships. Solid analysis of a great scene in a great movie. How does it connect with IMC? Can a company invoke reciprocity as a way to build brand loyalty. Can a company be like a person? Of course, there were many jokes about the status of corporations as people during the last election cycle. But how would this work for a company attempting to use social media. Wal Mart often uses their own employees as models in their flyers. Is that a self-disclosure that fosters some level of positive customer response? The challenge is age old: sometimes authenticity runs counter to rhetorical effectiveness. Thanks for the post. This works well for a company attempting to use social media. A great example is the non-profit organization To Write Love on Her Arms. They continually use the social penetration theory to reach out and connect with individuals who are living similar experiences as the ones sharing their story. Individuals self-disclose in hope that others will also self-disclose (reciprocity). According to Andrew Potter in “The Authenticity Hoax”, authenticity is often associated with positive terms such as “community” “family” and “natural”. Wal-mart knows that and what better way to achieve those words than with their own employees. Thanks for your comment! I really enjoyed this article, I think looking at something in a movie and using it to describe a theory in communication is a very good idea. This movie can be used in advertising because it is so well known and many people can relate to it. A company could really use this as an example of bricolage. I love this movie as well! In the 80’s this scene made me pause I understood the pressure to be popular, the need to fit in. Now as a parent I embrace the bonding in the film, while I question the implications of superiority and bullying. I think we all have a bit of all these character in each of us, the athlete; the brain; the princess; the criminal; and the basket. Thank you for the suggestion. Versatile movies, such as this one, are able to apply to many theories. An example of a movie used in advertising is Ferris Bueller’s Day off in a car commercial that was directed towards a generation who grew up watching the movie, so great advice! That’s a great way of putting it–we each have a bit of the characters in us. As we said above, this can help us understand this scene through Social Penetration Theory because we are able to understand their behaviors and thus determine how to understand our own behaviors in our personal relationships. By relating to the character’s, we’re more apt to learn something from the scene that can be used in our own life. I really enjoyed how you took a very popular movie and brought it back to Comm Studies. Taking something well known by the community and relating it back truly helped me understand the concept of the Social Penetration Theory better. Great job! This blog post was a great read. I noticed many concepts discussed in the Communication Studies major, especially my current class, Interpersonal Communication. With the Social Penetration Theory, you begin slowly “peeling off the layers” and sharing more and more information. The initial conversation is usually what the public can see and information you are wiling to express. However, once you begin to peel back those layers, more personal information is revealed and an intimate relationship progresses. When one person discloses personal information, it becomes easier for the other person to share feelings as well. The video clip from the Breakfast Club shown above is a perfect example of this. I agree that by looking at this movie from this theory’s perspective, you can better understand how the relationships between the students were formed. First off, love this movie and this scene. The way Emilio reveals himself is a lot in the ways I believe I reveal my own self. There are so many things people believe they know about me just from what they see on the surface. I actually talked about this theory with my now boyfriend when we first started talking. He was always so aggravated because he called me complicated and told me he knows there’s more to me that isn’t coming out. With that I informed him on the social penetration theory, of which I’m also learning about in Interpersonal Communication. The idea is that on the surface I look like one thing, but I’m totally different the deeper you go, like Emilio. Revealing oneself isn’t easy and it comes with time. It’s a way to build a relationship step by step based on the comfort levels. This scene always reminds me of who I am and why I like this movie so much: I relate to it. I think this is a brilliant way to convey your thoughts. The Breakfast Club was an amazing movie and it did deal with some serious communication aspects. The scene you implemented was a very impactful scene and perfectly represents the “peeling back of the layers”. It is easy to gain peripheral information about people. However, to get deeper into those layers it does normally take that one person willing to be vulnerable and open up. It helps to have it reciprocated and to keep a healthy door of communication open. Great article though, very creative. We thought that choosing a classic, well-known movie would help more people understand the Social Penetration Theory and how it can be applied in real-world situations. It’s interesting to see that this theory has been helpful in your personal life, Kendall. Thank you all for your insightful comments! I would have never thought to use such an amazing movie to make the connection with the Social Penetration Theory. I think that this movie really exhibits the “peeling back the layers” to who a person really is. I like that this movie, and your article, make people realize that there is always more to a person than what meets the eye. The person you are when you first meet people is not the real “you.” In order to see someone and really get to know who they are, not just who they seem, you do need to peel back the layers and find out what makes them who they are. It is so easy to see someone and cast your judgement without ever so much as talking to them. You think you know a person because of what you have seen or heard, but as the Breakfast Club showed us, there is so, so much more. Sometimes it just takes some time- or a Saturday detention- to find out who they really are. The Breakfast Club is a great example for the Social Penetration Theory. I did not have trouble understanding the concept or factors that come into play with the theory after reading this article. In addition to Emilio’s confession, I think the scene when Allison, “the criminal,” pours her purse out to share her “layers” is another good example of the Social Penetration Theory. I always enjoyed this movie and never really looked at this scene in that perspective until I read this article. It was and is still an emotional scene. It can be easy to judge people until you start communicating with people and figuring out why they act the way they do. Great article! One of my favorite movies! Reading this made me think of my own experiences meeting people and how my relationships have changed so much from each first impression to the relationships I have now. Your analysis of this classic movie really was insightful and thought-provoking. I couldn’t think of a better example overall of the social penetration theory than this movie. I am slightly biased because it is a favorite of mine, but I love how the main social stereotypes are represented in this film. It is successful in showing this theory because it starts off with the first layer of the onion; introducing what everyone perceives the students’ stereotypes as. It then reveals their quirks, yet another layer, and lastly introduces the pressures that each of them face in that famous, emotional scene. This trust that they instill in each other creates a comfort where reciprocity can be received. This was a great example of reciprocity and the Social Penetration Theory! Collectively, it seems that you all thought The Breakfast Club demonstrates this theory well–which was our overall goal! It can definitely be eye-opening as to how we can apply classroom theories into our own lives, as some others have mentioned above. Each character in this film presents us with the opportunity to apply their scene to the Social Penetration Theory, similarly to Allison pouring out her purse–great example! Overall, the intent of this scene is to demonstrate the theory from the initial “peeling back layers” and how that progresses and develops those relationships. Thanks for commenting! I absolutely love this movie! After reading this it made me realize since I’ve been in college the different people I’ve worked on projects with and how at first I thought they were different compared to me. No matter how different they are from people I would’ve picked to work with when I was younger, I realize how they’re not to much different at all once you get to know them as a person and see the real person underneath. It is definitely a great example of the Social Penetration Theory. I think that the Social Penetration Theory is a great choice to analyze this scene in The Breakfast Club. Picking a film that is so well known across multiple generations makes the connection to the theory easy to understand and dissect. I saw that you mentioned in the comments that To Write Love on Her Arms uses Social Penetration Theory in their marketing technique, what are some other companies that use this theory? Great use of one of the most popular movies out there. Like many other have stated it does a great job portraying Social Penetration Theory. It was really enjoyable reading your article along with the many comments. I though that this was a great way of showing the Social Penetration Theory. Honestly, I didn’t really know what it was but now I have a much better understanding. I believe in the Social Penetration Theory and that people use it every day even if they don’t know it. In Emilio’s case, there were five people who have completely different personalities but all end up in Saturday school detention. Because they were all in the same place at the same time, with the same punishment, it allowed them to each open up to one another. The openness of this theory allows for new relationships to evolve. Awesome insights. I’m glad Breakfast Club is on Netflix because I will be watching it tonight. I think that you have hit on something that points out why that movie is a classic and why it is still enduring and relevant today and to IMC. If branding is an organizations story then they should want us, the consumers, to feel that openness and connection. A brand needs to peel back the layers of their onion so we know they can be trusted. The movie was a great example for the social penetration theory. When you’re stuck with ha group of people outside of your friend group it may be hard to break through and talk at first. This movie shows how the truth starts to come out. I really enjoyed the article. We are thrilled that you guys find this theory so relateable and easy to understand using the Breakfast Club. We knew that people who easily relate to this movie because it is so popular across a wide age range. Carol, there are many companies that use the Social Penetration theory to reach their consumers. Non-profits use it a lot to reach out to their target audience in an attempt to create a connection with them. An example is the Wounded Warrior Project. They share stories of military veterans and their struggles in an attempt reach out to other military veterans who have similar struggles. I really liked how you used such a classic movie to help us better understand the Social Penetration theory. It seems that this theory really describes the whole movie; them trying to relate to one another and understand each other. It helped that you used such a classic movie that most of us have seen and are familiar with, and one that I otherwise would not have thought of to make the reference. Breakfast Club is a very good movie to draw insights on social penetration theory from. The specific example of Emilio’s story leading to a deeper penetration into the stories of others was very well put. It was a good focus for the topic at hand.